Bubbl was founded by the retired DISD police chief and a group of partners with safety, security at is core. The rise of services providing rides isn’t stopping anytime soon, and a former top law officer and his partners have founded a safer shuttle service for Dallas area residents. 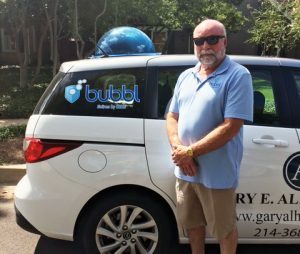 Craig Miller, the retired Dallas ISD police chief and a former Dallas deputy police chief, along with his partners Paul Adams, Alex Miller, and Zane Butter, have created Bubbl, a new shuttle service whose drivers are off-duty and retired police officers. The shuttle service officially launched Aug. 22. Customers can schedule rides on the website, Bubbl-Dallas.com, or through the app, when it launches later this fall. There are three service options available to riders: Bubbl Rides, Bubbl Kids, and Bubbl Flat Rate. Rides are currently available in the Park Cities, Preston Hollow, M-streets, Uptown, and parts of Lakewood. Julie Burns, a spokesperson for the service, said that it only made sense for these police officers to continue serving their communities. If parents want to know where their kids are while they are en route to school, they have the ability to track them through the website. Although the police officers won’t be wearing their uniforms or enforce laws while they are driving, safety is their biggest concern and priority. “Transportation companies have increased over the last five years and we are starting to see an increase in legal action against these organizations regarding driver misconduct. We wanted to provide a shuttle service that is, above all else, safe and one that our community can depend on,” Adams said in the press release. Bubbl said it owns and insures all of its vehicles.